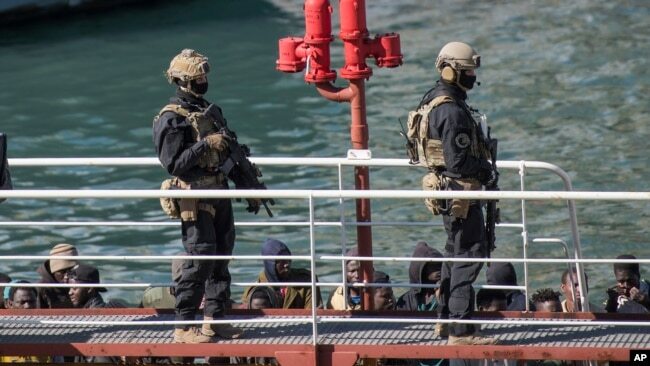 Armed forces stand on board the Turkish oil tanker El Hiblu 1, which was hijacked by migrants, in Valletta, Malta, March 28, 2019. A Maltese special operations team boarded the tanker Thursday and took control of it before escorting it to a Maltese port. African migrants who hijacked an oil tanker after it rescued them in the Mediterranean Sea seized metal objects and began smashing the ship and threatening crew members after they realized they were being returned to Libya, the ship’s captain said Friday. Nader el-Hiblu, the 42-year-old Libyan captain of the El Hiblu 1 ship, said he and five other crew members feared they could be killed during the “horror” that played out at sea this week. He said the threats by rioting migrants forced him to agree to their demand that he take them to Europe, not back to Libya. “They attacked the cockpit, heavily beating on the doors and the windows and they threatened to smash the boat,” el-Hiblu said in an exclusive account given Friday to The Associated Press. He spoke by phone from the ship, which is now docked in Valletta, the capital of Malta. “They went nuts and they were screaming and shouting ‘Go back! Go back! Go back!’” he said. Migrants are disembarked from the Turkish oil tanker El Hiblu 1, which was hijacked by migrants, in Valletta, Malta, March 28, 2019. For years, the Mediterranean Sea has been a place of drama and death as desperate people from Africa and the Middle East board unseaworthy smuggling boats with dreams of a better life in Europe. Last year, 2,299 people died in the sea trying to head to Europe. The dangerous journey has killed 311 people so far this year. The migrants revolted against heading back to lawless Libya, where aid groups say migrants are beaten, raped and tortured on a regular basis in detention camps. Some aid groups called the migrants’ actions “self-defense” against Europe’s inhumane migration policies. Now, there are fears that some merchant ship captains might become reluctant to save migrants from sinking boats if they fear they could lose control of their ships. El-Hiblu said the drama began Tuesday afternoon when his tanker was traveling from Istanbul to Libya. He was contacted by a military aircraft flying above — though he isn’t sure if it was Maltese or Italian — alerting him of a boat with people who needed help. He then approached the boat, which he said was carrying 98 men, women and children. The aircraft then contacted him with a second location and he went there, but lost contact with the plane and the boats, he said. FILE - Guinean migrants wait at the airport before being deported to Guinea, in Misrata, Libya, Dec. 27, 2017. 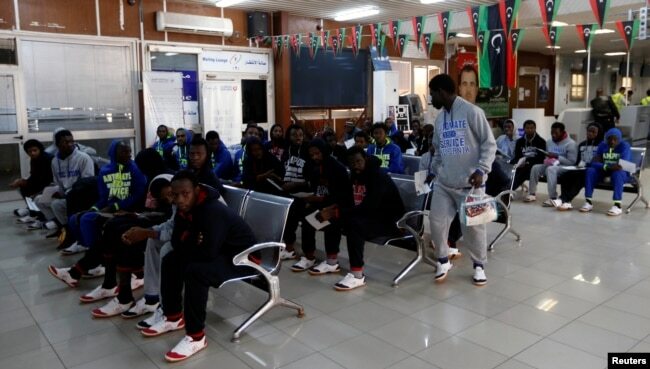 At 6 a.m. Wednesday, el-Hiblu alerted Libyan port authorities that he was nearing the coast and requested assistance from coast guard or naval forces, aware that the migrants would become upset at realizing they were returning to Libya. But help didn’t come. When the Libyan capital of Tripoli came into view, about 25 of the male migrants began their attack, he said. Libyan Coast Guard Spokesman Brig. Gen. Ayoub Gassim said when the Libyan coast guard learned about the hijacking, they sent two boats in “hot pursuit” over a distance of 60 nautical miles (110 kilometers), but said the tanker was faster than their boats. El-Hiblu insists, however, that the Libyan coast guard could have reached his tanker had authorities wanted to. As the tanker moved north, news started spreading it was heading either toward Malta or the Italian island of Lampedusa. Italian Interior Minister Matteo Salvini, who has a strong anti-migrant stance, said Italy would not accept them. At first, Malta also insisted it would not accept the vessel in its waters. 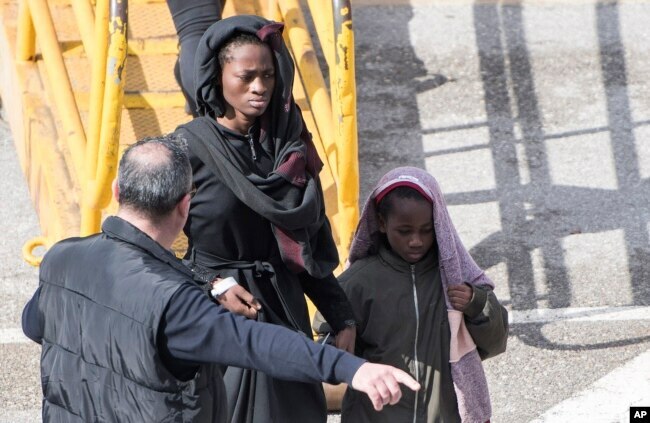 But Thursday morning, the Maltese armed forces stormed the vessel and detained five men suspected of leading the hijacking, taking them away in handcuffs when the ship docked in Valletta, the capital. El-Hiblu was incensed, however, at his treatment by a Maltese security officer, who ordered him to take off his clothes for a body search and confiscated his phone. He said he was detained for a couple of hours in a cell in a police station near the port, under suspicions of being a human trafficker. “This filthy country treated me in a very disrespectable way after rescuing 98 people. They dealt with me as a criminal and accused me of illegal migration,” he said angrily. Maltese officials would not comment on the tanker hijacking case as they carried out an investigation. It was also impossible to speak to any of the migrants who had been on the ship to hear their side of the story.